And the media does this day after day after day until you don’t know what’s real and what isn’t. That’s what’s stoking thousands of crazy people on the left. 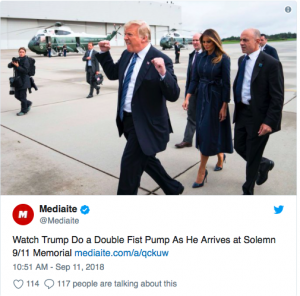 The service member, who asked to remain anonymous, told TheDC that the double fist pump was a greeting to the gathered crowd, which included a number of members of the military and their families and supporters.